Yesterday 1,000 maroon-robed Buddhist monks led 100,000 civilians in a peaceful march against the ruling military junta in Myanmar, the largest demonstrations since 1988. The military cracked down hard nearly twenty years ago, and thousands died. Aung San Suu Kyi, the leader of the opposition National League Democracy has been under house arrest for most of the time since the uprising. 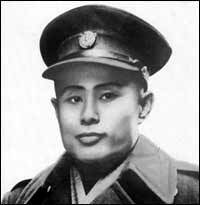 Aung San Suu Kyi is the daughter of Aung San, the liberator of Burma who was assassinated in 1947 just before Burma achieved independence. 500 monks visited her home last Saturday, where she made her first public appearance in four years. The Buddhist monks in Myanmar protesting against the governing junta are probably the only social group in the nation that can cause the government to flinch. The huge protests in Yangon, the capital (formerly Rangoon) were sparked by the government raising fuel prices, in a poverty-stricken nation already wracked by shortages. There are perhaps as many as half a million monks in Burma, which is not unusual in places like Burma and Thailand which practice theravada Buddhism. A great many of the soldiers the military junta relies on to maintain power were probably monks at one time. The monks are highly esteemed in Burmese society, and given great deference - which causes headaches for the military regime. According to journalist Zinn Linn, a former prisoner in Myanmar, "for many - even the most senior generals – to act against the monks is the highest crime in Buddhist teachings, so they are reluctant." The Freedom in the World 2004 report by Freedom House notes that "The junta rules by decree, controls the judiciary, suppresses nearly all basic rights, and commits human rights abuses with impunity. Military officers hold most cabinet positions, and active or retired officers hold most top posts in all ministries. Official corruption is reportedly rampant both at the higher and local levels." 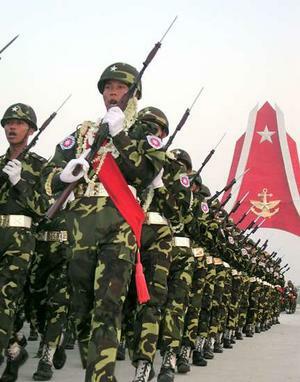 Brad Adams, director of Human Rights Watch's Asia division, in a 2004 address described the human rights situation in the country as appalling: "Burma is the textbook example of a police state. Government informants and spies are omnipresent. Average Burmese people are afraid to speak to foreigners except in most superficial of manners for fear of being hauled in later for questioning or worse. There is no freedom of speech, assembly or association.